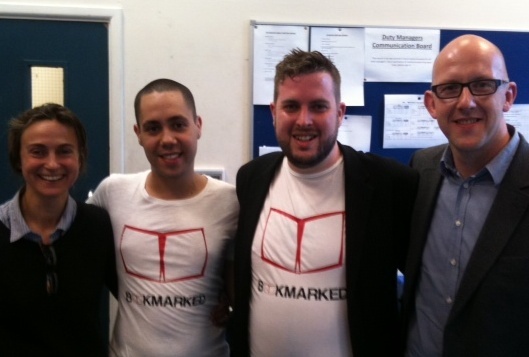 Last week was the second Bookmarked Literary Salon and what a criminally good night it was. 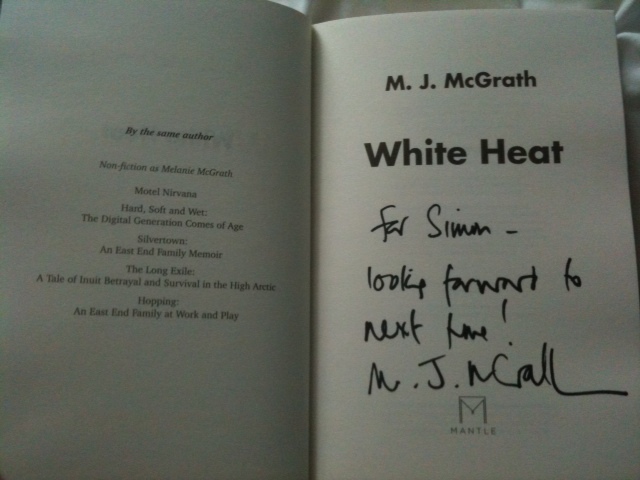 You all know how much I love a good crime novel so to have the legendary Val McDermid and wonderful debut novelist M.J. McGrath (or Melanie as I’m now allowed to call her) was bliss for me. I went and did that silly getting nervous thing again, fortunately it didn’t last long and we were soon chatting away between having our photos taken together before it all started off. 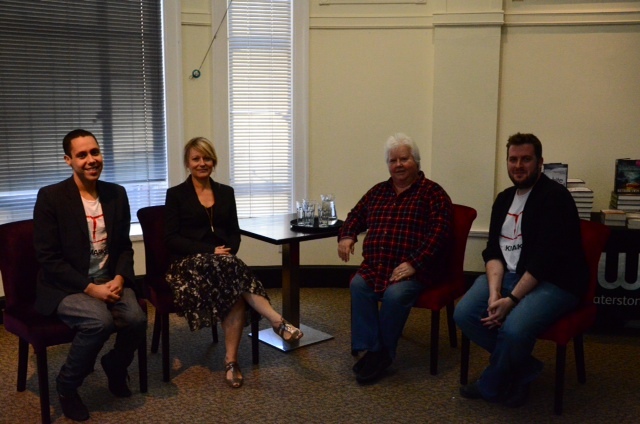 After each author had done a reading it was time for a good old natter, you may notice we changed the seating from last time so it’s less authors vs. hosts. The conversation flowed and it all went far too quickly. Melanie had tales to tell from quite another world, the arctic, and how her friends can Facebook her and tell her they have a dislocated shoulder but can’t get to a hospital or drugs delivered because they are so remote. As she spent lots of time in the arctic as a journalist (and wrote ‘The Long Exhile’ which I am now desperate to read) she also had wonderful tales to tell of the Inuit life and how she became a figure of fun after locking herself out her house, with only ten minutes till she would freeze to death, and getting to grips with peeing when it becomes an icicle mid-flow. Oh and a brilliant semi-tragic tale about a hunter who met his match with a polar bear he was after. It was utterly fascinating. Too soon and it was all over. Time to sign books for the wonderful audience who came along, including Polly of Novel Insights, and made it such a wonderful event we didn’t want to end. In fact we loved it so much we might just be having another meeting of the same minds next year, we shall see. 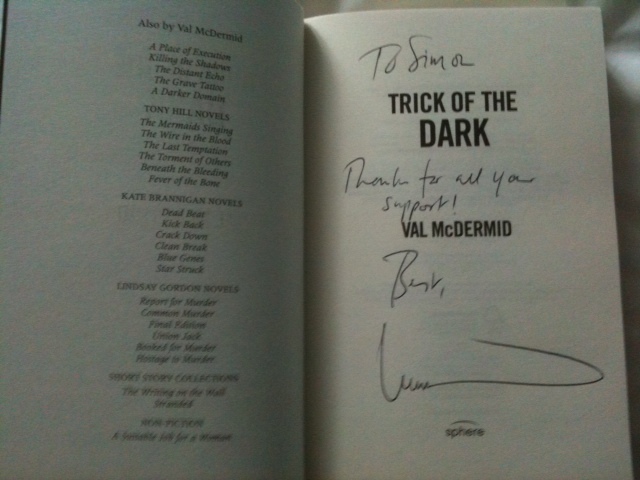 Val and Melanie have said they will and Melanie even wrote a contractually binding comment in my copy of her book, so I’ll be holding them to that! Thanks again if you were in the audience, I did speak to some of you but not all. It was a wonderful evening and if you couldn’t make it I hope this post gives you a feel for the night. I’m loving this salon malarky, can you tell? Bookmarked will be back in just under two weeks, time really flies, on Monday the 3rd of October for a Victorian themed evening (with two of my favourite books of 2011 and their authors) of ‘Sensational Stories’ as Jane Harris will be discussing ‘Gillespie and I’ and Carol Birch will be talking about ‘Jamrach’s Menagerie’, as well as all things Victoriana based, to say I am excited would be an understatement. I hope to see you there (if not I will report back again)! Tonight we have two wonderful crime writers coming to Waterstones Deansgate in the heart of Manchester, and I know they are wonderful because I have read them both. 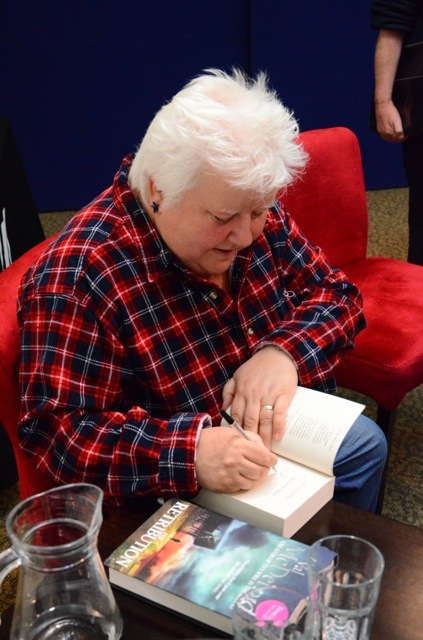 You will all know its only been in the last year that I have started reading Val McDermid’s novels but what a treat, in a slightly murderous way, they are – so I am delighted that she is attending and am looking forward to having a good old natter with her before hand. We will also be joined by debut novelist Melanie McGrath, or M.J. McGrath, who Val recommended I read (which I have and it was brilliant – in fact I reviewed it earlier today) and has kindly invited as a special guest. So it should be very, very good. If you are in the area do pop in and say hello, it will be a night of much bookish banter and delights. If you can’t make it I will report back in due course. Ooh, the nerves are starting again. For more information visit the Bookmarked website here. 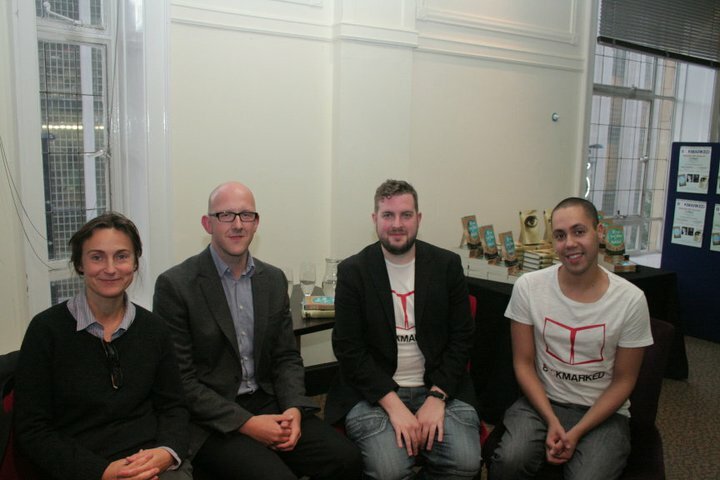 It’s been over a week since an idea I had became a reality and the Bookmarked Literary Salon opened its doors in Manchester’s Waterstone’s Deansgate for its debut night. I thought I would give those of you who couldn’t be there a report on the event, which started with me being unusually nervous. In fact have to admit I don’t think I have been that nervous before. I went all giddy at about lunchtime however my Mum and sister aka ‘The Girl Who Read Too Much’ (who read both books the weekend before, impressive) had come to visit, sadly no Granny Savidge Reads, and offered support and calming words like ‘get a grip’ before I had to leave to pick up our Bookmarked t-shirts and go and meet the authors off the train. We then went in and couldn’t quite believe out eyes, the room was pretty much full; people were standing at the back (though there were a few seats at the front, why does nobody ever want to sit at the very front), I have to say I could have done a little weep of joy, instead – like true professionals – we introduced the authors and started with a reading. 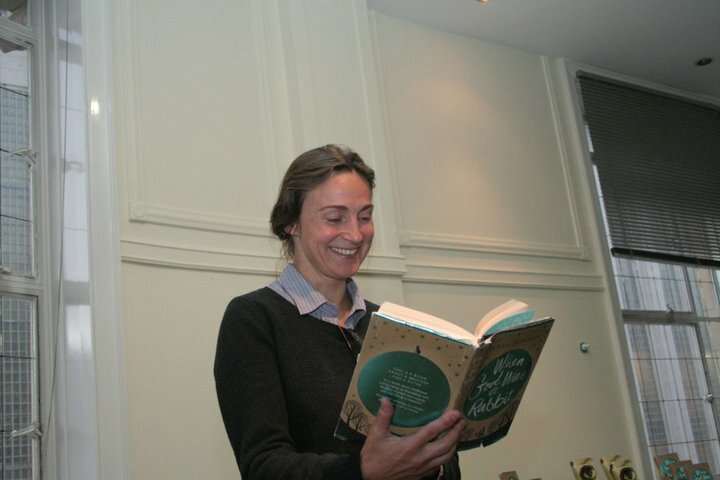 Sarah had everyone in stitches with her reading from ‘When God Was A Rabbit’ and SJ had us all on the edge of our seats when he read from ‘Before I Go To Sleep’. Then suddenly over an hour had vanished before our eyes and it was time to stop and also time for a quick photo again, can you see the mix of relief, joy and ‘oh no its finished’ on my face? Before it was all over and we were saying goodbye as the authors headed back to the train station and I headed for a strong drink and a meal with friends and family. I did manage to ask Sarah which she preferred, a comfy chair with me and Adam or with Richard and Judy… I am too polite to share the response, hee hee. Thank you to everyone who came, we had a great time and we so hope that you did. I know Lucy has written up her thoughts, which was really kind, but Lucy why did you not come and say hello, in fact that applies to a few tweeters and followers who turned up. Oh and Emma, thank you for saying hello I am so sorry our conversation was cut short, email me and lets go for a coffee. We hope we will see you all on the 12th of September when we will be having a crime-fest with Val McDermid and a special guest. You can find out more here. Right, I will stop waffling on and on but I am just thrilled it went so well. If you came, thanks again, if you didn’t thanks to those of you who wished me luck, it meant so much to me. Well in the next few hours I will be an utter nervous wreck as I wait at the station to greet Sarah Winman and SJ Watson from the train, along with their lovely publicists, and we head for a drink. Yes it’s finally here (and scarily too soon), Bookmarked Literary Salon opens it’s doors tonight, sometime between 6.30 and 6.45pm. I say I will be nervous but I already am. My heads full of the following… Are my questions too silly? Will the authors think I’m a loon? Will people enjoy themselves? Will anyone turn up? Well not long to find out. Wish me lots of luck…and please feel free to let people know. I’ll report back, if I survive it, ha! For more info do check here! Eek! I can’t actually believe that the ‘Debut Night’ of Bookmarked is going to be actually happening in just 7 days. I am getting very excited but also slightly nervous. When I first mentioned it on the blog it seemed that the actual night was a million miles away, now it is just a mere week away. Eek. So now all I have to do is think about what to ask the lovely Sarah Winman (I am also listening to her read her book whilst I wander round the supermarket/library/clean the house) and SJ Watson, I have lots and lots of things I am dying to grill them about, its simply simplifying them and leaving stuff to my co-host Adam to the lovely audience to ask too. What have you always wanted to ask an author? 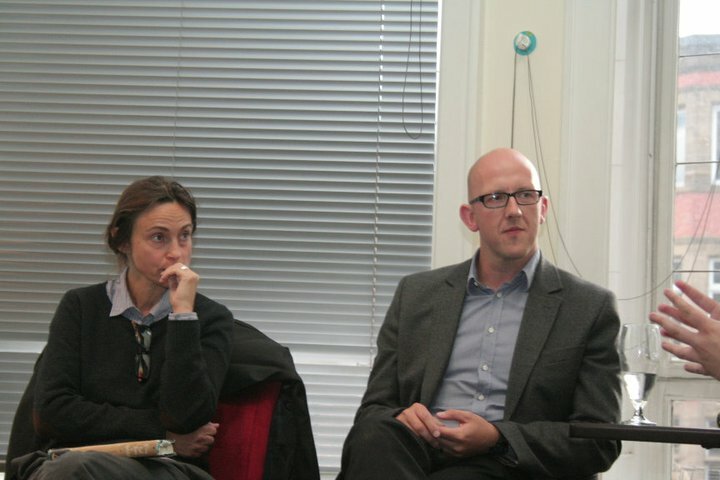 What would you ask Sarah Winman or SJ Watson if you could, let me know and I will mention your question specifically? Will any of you be coming to Bookmarked so I can make sure I say hello? 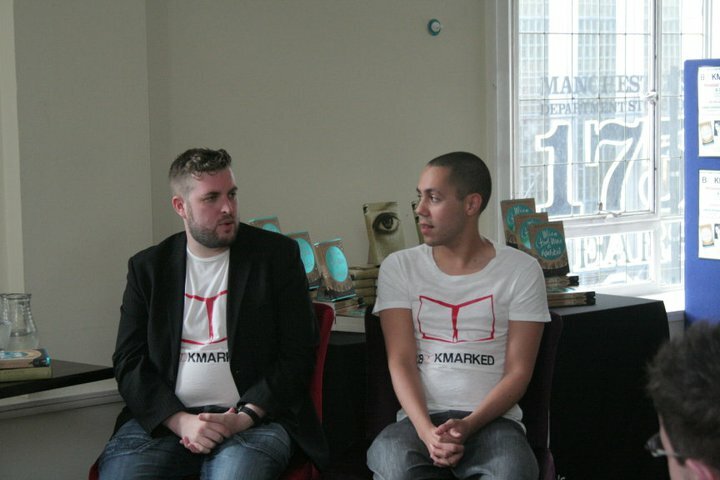 Two stand-out debut British novelists launch “Bookmarked” – a new literary salon co-hosted by Simon Savidge and Adam Lowe at Waterstone’s Deansgate. Monday 8th August, 6.30pm at Waterstone’s Deansgate in the heart of Manchester – “Bookmarked” aims to bring something new and fresh to the Manchester cultural scene. 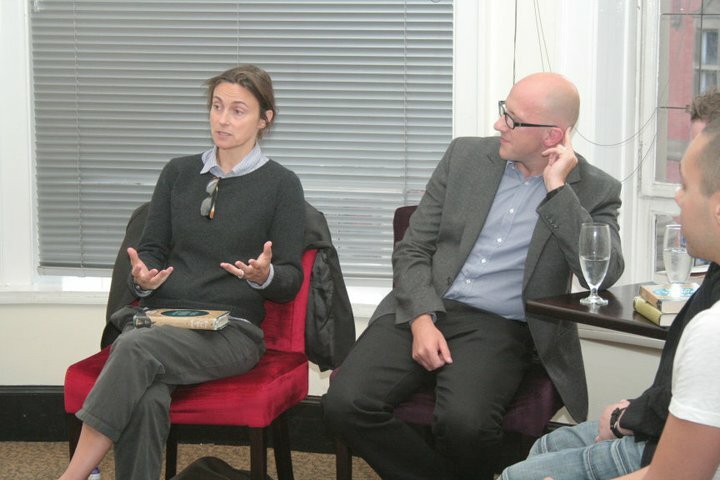 Two of the most talked-about and bestselling first-time novelists of 2011, Sarah Winman, author of “When God Was A Rabbit” and SJ Watson, author of “Before I Go To Sleep will be in conversation for the first time together – discussing their writing; plotting and characterisation – and how they travelled the rocky road to publication. S J Watson was born and grew up in Stourbridge, in the West Midlands. 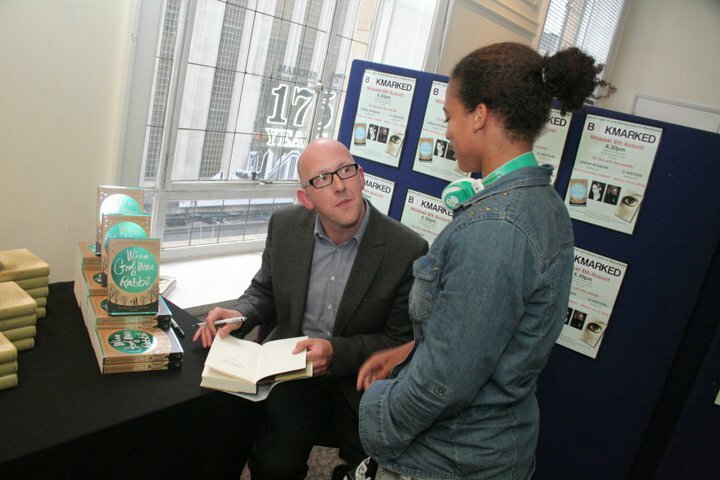 After graduating with a degree in Physics from Birmingham University, Watson moved to London and began working with the hearing impaired in various London hospitals, eventually specialising in the diagnosis and treatment of hearing impaired children, whilst spending evenings and weekends writing fiction. 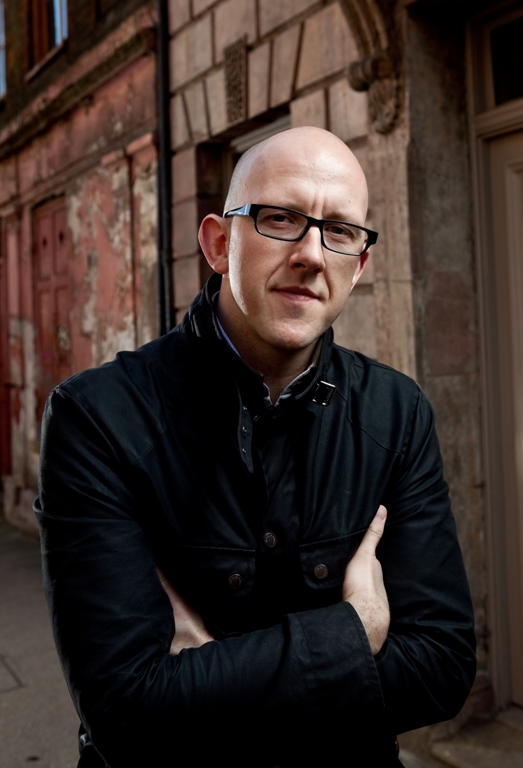 In 2009 Watson was accepted into the first Faber Academy ‘Writing a Novel’ Course, a programme that covers all aspects of the novel-writing process. ‘Before I Go to Sleep’ is the result. Now sold in over 30 languages around the world, ‘Before I Go To Sleep’ has been also been acquired for film by Ridley Scott’s production company, Scott Free, with Rowan Joffe to direct. It was also chosen for a ‘Book at Beachtime’ on Radio 4 Extra. 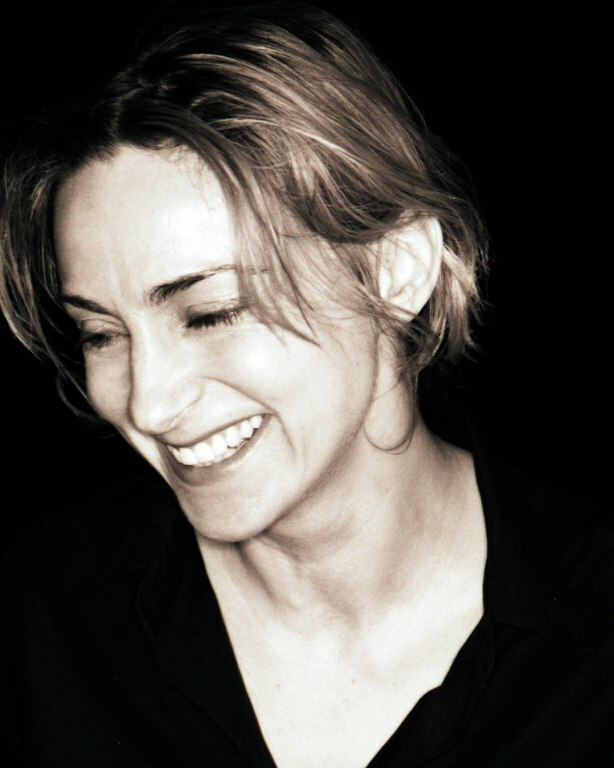 Sarah Winman grew up in Essex. She attended the Webber Douglas Academy of Dramatic Art and went on to act in theatre, film and television. ‘When God Was A Rabbit’ went straight into the Sunday Times Bestseller List and has been chosen by endless book groups over the year including Richard and Judy, Waterstones and Grazia. It was selected for Simon Mayo’s Book Club on BBC Radio 2 and it was also chosen as one of the ‘Waterstones 11’ which highlighted the debut novels to get excited about in 2011. Sarah lives in London and loves to escape to the family home in Cornwall as much as possible. 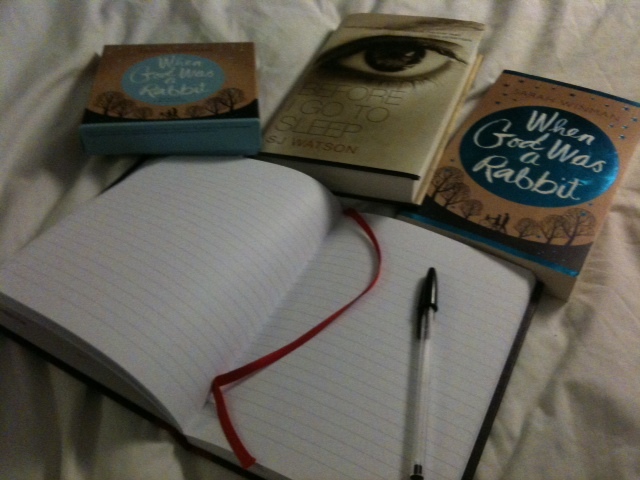 ‘When God Was a Rabbit’ is her first novel and she is currently working on her next. 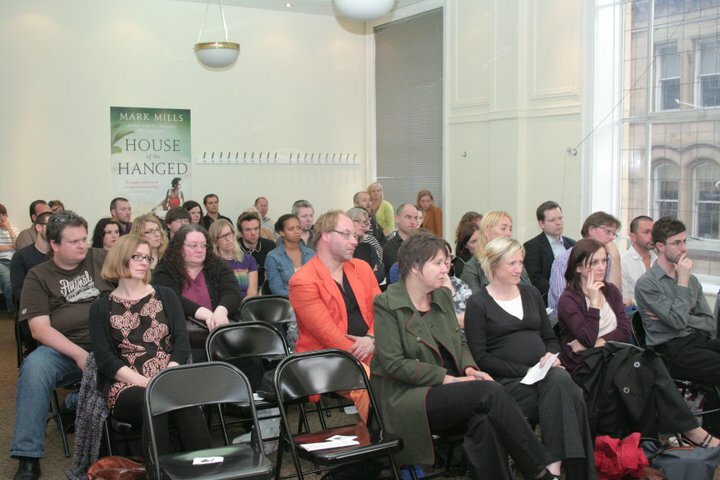 Bookmarked ‘Debut Night’ will be Monday 8thof August 2011 at Waterstones Deansgate with warm up drinks at 6.30pm. 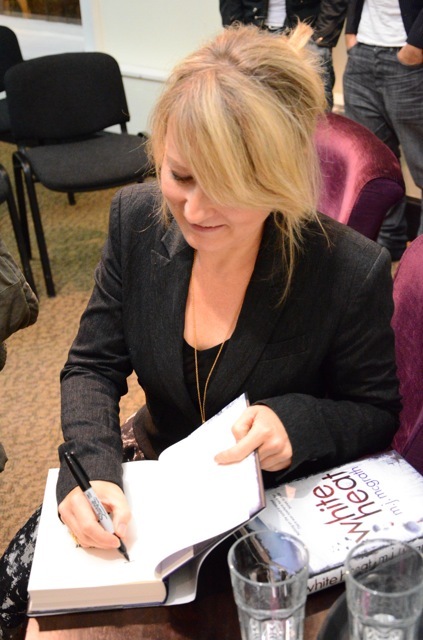 Bookmarked ‘Crime Night’ will be the first week of September 2011 same venue, same time, with two of the biggest British female crime writers. More details to be announced soon. For further information on Bookmarked, the authors it is featuring, the hosts Simon Savidge and Adam Lowe (who are available for interview and features) email bookmarkedsalon@gmail.com you can also visit the website here.